Photoshopping and its related manipulative ilk. We talk about such electronic chicanery a lot for human models, but not so much for watch models. Why? We can be similarly seduced, mislead, astonished, disappointed, persuaded into reckless expenditure, after all. No I am not here today to tell a sorry tale of how a photoshopped watch bewitched me out of my last cents, but to share how different my impressions of Tudor’s Heritage Black Bay and Pelagos models turned out to be when I managed to see them together for the first time ‘in the metal’ at The Hour Glass here in Sydney. I blogged about the Black Bay (on the ST blog) when it came out. Inspired by the brand’s vintage divers from the 1950s but modernised, the ‘snowflake’ references for the watch relate to the distinctive shape of the hands, a feature of some 1970s models (e.g. ‘Snowflake Submariner’) – it’s basically a 1950s Tudor with 1970s influences sized for 2012 preferences, and with added colour. I admit that I fell a little bit in love with the photos of the watch, the vintage-inspired domed crystal and the matte burgundy bezel in particular. The vintage-styled leather strap version was my preference. 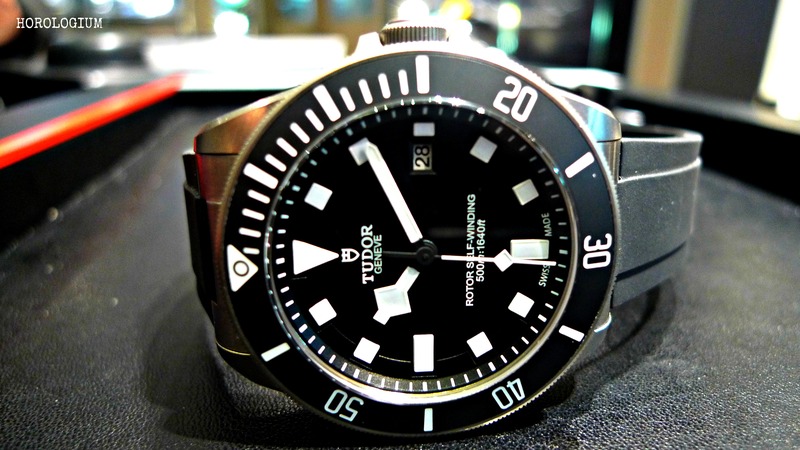 The second Tudor dive watch that was launched at the same time was the Pelagos. At 42 mm, it has a satin-finished titanium case with a black ceramic bezel, is rated to 500 m (1640 ft) with a helium escape valve, and contains the same ETA 2824 as the Black Bay. 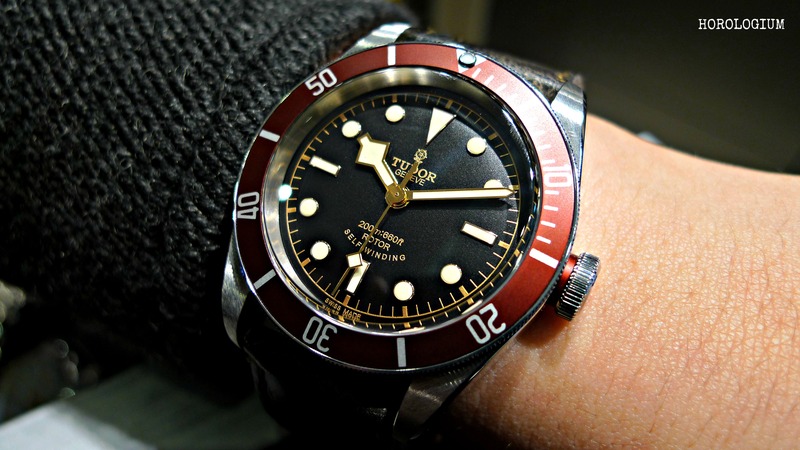 Again there are vintage nods in this watch, with design cues also coming from the Snowflake Submariner, and pointy crown guards which reference early Tudor Subs. In seeing the photos of the Pelagos, it didn’t do all that much for me, perhaps because I struggle to personally get overly excited by Submariner type watches, however much I may be able to appreciate their function and design. It was only when I had the opportunity to see the both of them together that I realised that yet again, image manipulation had messed with my mind; the Pelagos changed places with the Black Bay. Why? Well firstly, the Black Bay, although an attractive watch, just didn’t turn out to be as I’d expected based on the official photos I’d seen. The tone of the burgundy, which had been a major drawcard for me, just didn’t seem quite the same. I discovered that the colour I saw ‘in the metal’ was even slightly different to how it appeared in my own photos. The second unexpected thing that arose was that the dial was more brown than I had thought it would be. I gather that it’s technically black, but there is definitely a brownish aspect to it. It’s not a bad looking watch (and unlike most people, I like the burgundy accent on the crown), but when a watch’s appeal has been largely due to aesthetic reasons related to colour, and when those colours appear different in real life, as was the case in this instance … unfortunately it just didn’t grab me anymore. On the other hand, the utterly function-focused Pelagos to which I’d not paid much attention, now had me. The brushed titanium and ceramic bezel are matte, very modern, and surprisingly elegant. I love the use of titanium in particular, both in terms of looks, and weight. It’s very much a streamlined functional tool watch, complete with a spring-loaded clasp that allows for fine adjustments and an active setting that will tighten the clasp automatically during diving. 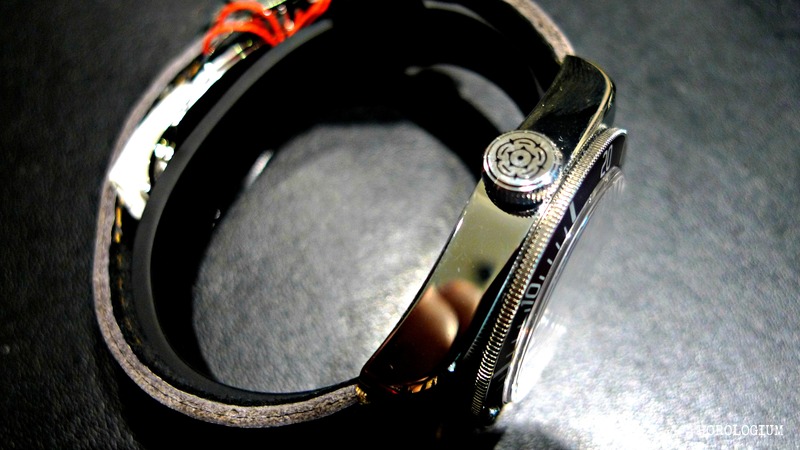 It’s a sleek and discreet, and looks particularly good on a rubber strap. Black Bay vs. Pelagos : which is your pick? ADDENDUM (DECEMBER 2015) : Subsequent to these two models there have been a number of new colours released of both models. For my thoughts on some of these, go to this link for the Pelagos Blue and this link for the Black Bay ‘Black’ in particular. I own the Black Bay Blue and it is still my preferred colour for the Black Bay. 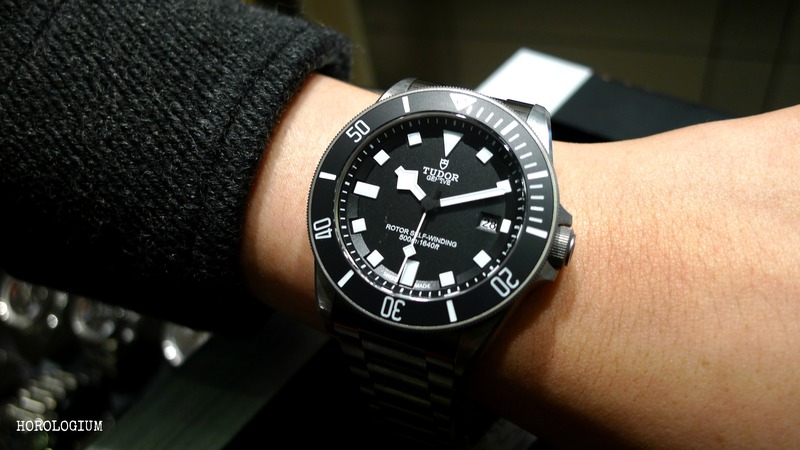 For the Pelagos, I still think the black version is king. 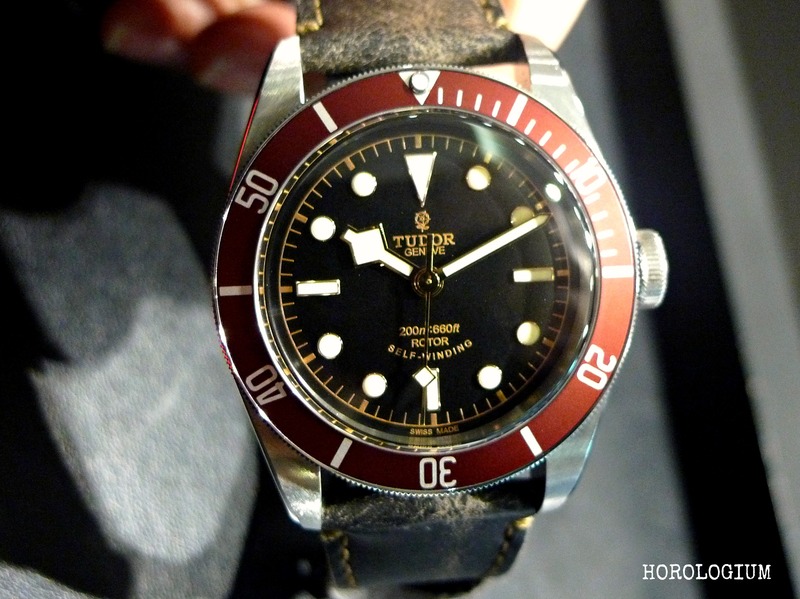 ADDENDUM (MARCH 2016) : At Baselworld 2016 Tudor introduced the Black Bay Bronze, which you can read about at this link, including the answers to my question about the type of bronze used in this piece. 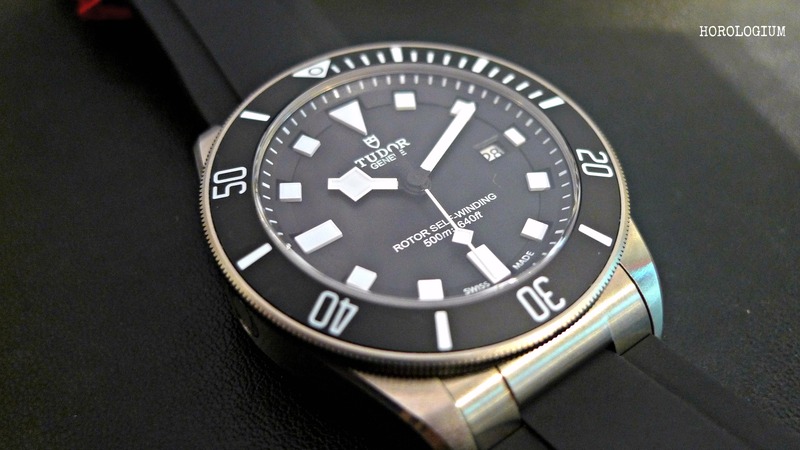 There was also a new ‘destro’ style Tudor Pelagos LHD. ADDENDUM (MARCH 2017) : At Baselworld 2017 Tudor introduced a Black Bay Chronograph and the Black Bay Steel. Now I’m tempted w the Ti Pelagos! U r the great enabler! Not as big as you think…the wristshot in this post is on a woman’s wrist (not mine). I had this exact same experience. The Black Bay is enormously appealing on the wrist and has just the right measure of vintage in its design. I’m a fan ! Great Post ! Thank you. Really interesting that you had similar experiences to these watches. Will you get a Black Bay? GO Pelagos!!! I was already sold when I saw the pics, but looks like it’s even better in person… hmmm…. Just wondering what everyone thinks about the ETA movement Tudor has used. I have read that it is robust and reliable but some think it is less desirable as it is made by ETA. 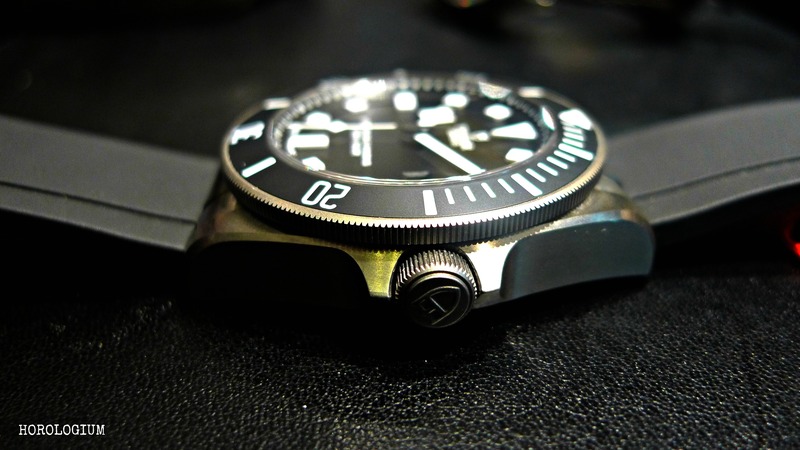 Going with the Pelagos for its tough titanium finish. 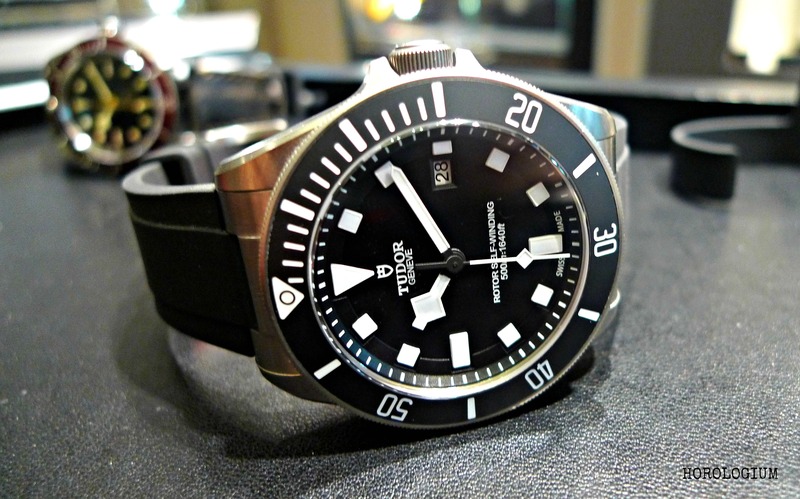 Great article, the opposite happened to me, I was/am interested in the Pelagos but when I had the chance to try both on the Pelagos didn’t cut it for me and the Black Bay felt for me much more attractive. I guess is all about expectations! @oscar – It’s funny how this happens, isn’t it? Will you get a Black Bay? Of either colour?